When you’re a natural girl you know how absolutely difficult it is to retain moisture and battle obnoxiously tangled hair. I recently came across this new product line called Beautiful Textures that is supposed to help us with all our hair woes. This line contains a total of 7 products: Curl Control Defining Pudding, Rapid Repair Deep Conditioner, Moisture Butter Whipped Curl Creme, Tangle Taming Leave in Conditioner, Tangle Taming Shampoo, Shine & Silken, and Curl to Straight. I have personally tried 2 out of the 7 products but I am only reviewing 1 on this post as I am still forming an opinion on the other (Tangle Taming Leave in Conditioner). 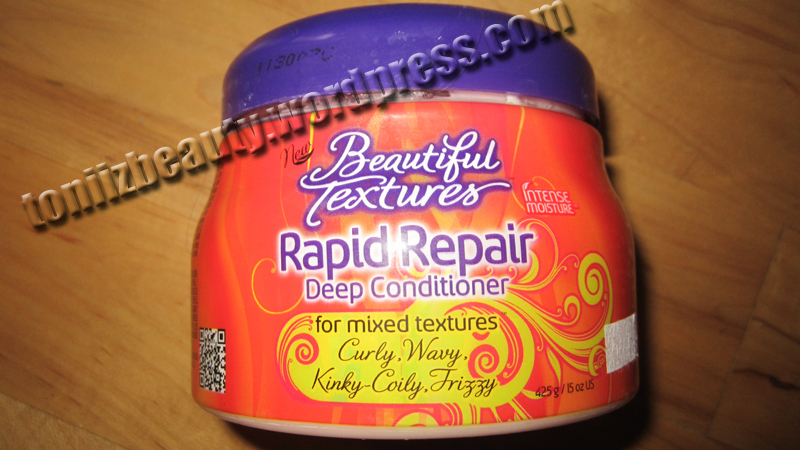 Let me just say this, the Rapid Repair Deep Conditioner is amazing! Prior to using this I was using Organic Root Stimulator Olive Oil Replenishing Conditioner for my deep conditioning treatments. However, the Organic Root Stimulator contains 12.25 oz and the Rapid Repair contains 15oz. While I still think its amazing, Beautiful Textures is cheaper and works just as good! Some of the ingredients are aloe vera, coconut, olive, soy, argan oil, shea and mango butter. Now if you’re one of those naturals that like to use products that are 100% natural ingredients then this is not for you. It has some great natural ingredients but it also contains some of those big long hard to pronounce words too! Me personally, If it works then I’m not a big stickler for the ingredients. What I love about it is that not only does it do a great job at moisturizing my hair but it does a great job at detangling my hair. My hair is so soft and slippery when I’m rinsing it out that the tangles just slip right out. An added bonus about the line is that the products are created for you to mix and match. For instance, if you want added detangling you can mix the Tangle Taming Leave in Conditioner with the Rapid Repair Conditioner. Let me just add that each product is under $7 and available at your local Sallys! I’m definitely going to try out a couple more of the products so stay tuned!